Ford Motor Company has apparently slipped in a sneak peak of an upcoming Mustang in one of its new ‘Built Ford Proud’ promotional videos. 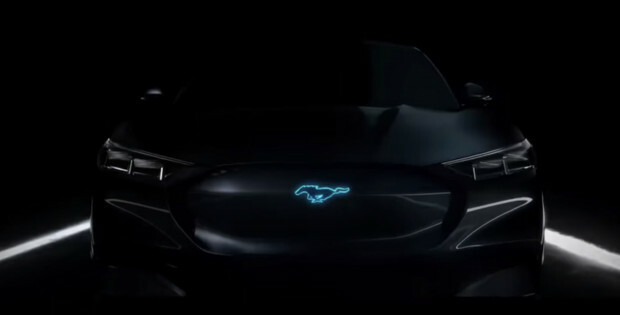 The illuminated front-on shot shows the iconic Mustang logo glowing atop a design we’ve never seen before. The image appears right at the :37 mark of the video, just prior to clips showcasing historical Mach 1 Mustangs. One could reasonably conclude that the future Mustang shown just after it is also the returned Mach 1; which seems like an appropriate name for a V-8 hybrid Mustang. It’s worth mentioning that the Mach 1 name was originally going to be reserved for Ford’s upcoming battery-electric crossover, but after announcing the name to negative public sentiment Ford has alleged changed course. The change of the crossover’s name frees up the Mach 1 badge for a future Mustang. Ford has already confirmed a hybrid variant of the Mustang is coming for the 2020 model year. The automaker has not provided any details surrounding the powertrain, but it will reportedly be based on today’s sixth-generation car. Oddly, the seventh-generation Mustang is due out in 2021. It’s unclear if the image in the video is of the 2020 hybrid or of the all-new seventh-generation car. I am not going to even begin on a vehicle that is still 2-3 year out. Designs can change in that amount of time. Some are thinking it could be the Mach 1 too. I doubt it though.